Can this item be used in the microwave? This item is not recommended for microwave use. Whether you're serving hot or cold foods, this Cambro 90SPCW401 Camwear 13.5 oz. 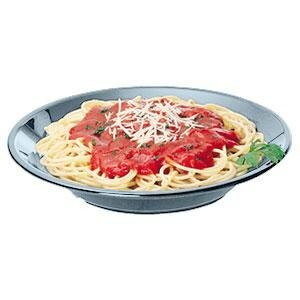 slate blue polycarbonate round soup / pasta bowl is sure to stand up to the daily rigors of a busy day in your foodservice operation. The perfect choice for serving soups and pasta dishes, this bowl is designed for superior stability on serving trays, making it a long-lasting, reliable choice for nursing homes, hospitals, daycares, and assisted living facilities. Not just for the healthcare industry, the entire line of Camwear dinnerware is right at home in any high volume establishment, like cafeterias and buffets, thanks to its high level of durability and scratch resistance. Made of virtually unbreakable polycarbonate, you can count on this piece day after day to deliver excellent service. This material will not absorb odors or flavors from foods, and it resists staining, ensuring that your patrons always have a pristine bowl, free of unsightly score marks and discoloration. The Camwear line of dinnerware is ideal for any establishment looking for an upgrade over disposable options, but still needs something that meets the demands of a high-turnover environment. Unlike china, porcelain, or glass, you won't have to worry about breakage with this dinnerware, yet it still offers a professional look that reflects positively on your business. Combining great performance with a clean, attractive appearance, this bowl will make an excellent addition to your dinnerware offerings. Beautiful bowls for soups, pastas, and more. We use them on our All You Can Eat Soup and Salad bar. They look nice and clean well in the dish machine.